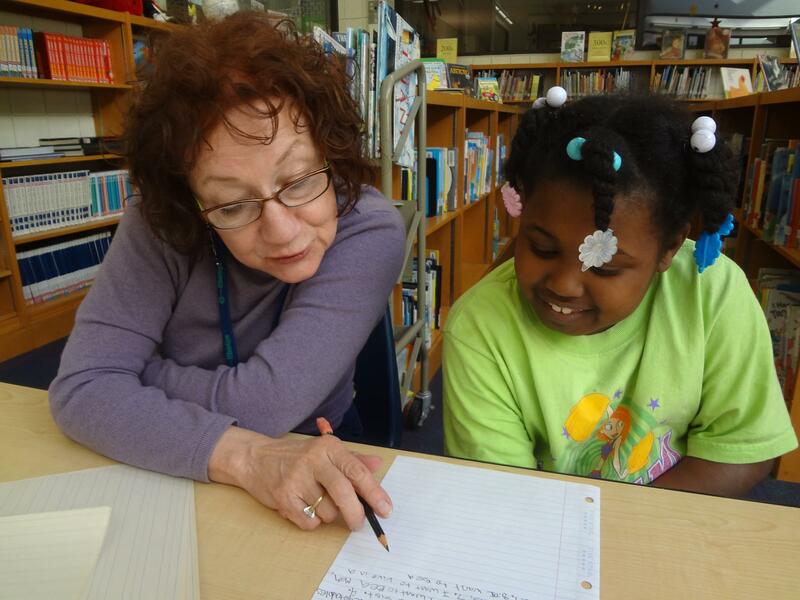 Volunteer Pat Gold (left) and Tiara Brooks work on a story at an 826 Michigan writing workshop at Adams STEM Academy in Ypsilanti. Adorable kids! Zombie hamsters! ZOMBIE HAMSTERS! Click on the link to listen. For 30 minutes each week, students at Adams STEM Academy in Ypsilanti set aside their science lessons and multiplication tables and just ... make up stuff. It's part of a workshop out of 826 Michigan, a non-profit writing center in Ann Arbor. They bring volunteers to the school to work with students on creative writing at no cost to the students or the school. "You can write a story about whatever you want as long as it's rated 'E' for everyone," explains Maggie Gibbons, the 826 Michigan volunteer who's in charge of the workshop at Adams. Nobody is forced to attend the workshop, but Gibbons says most students clamor to be picked. 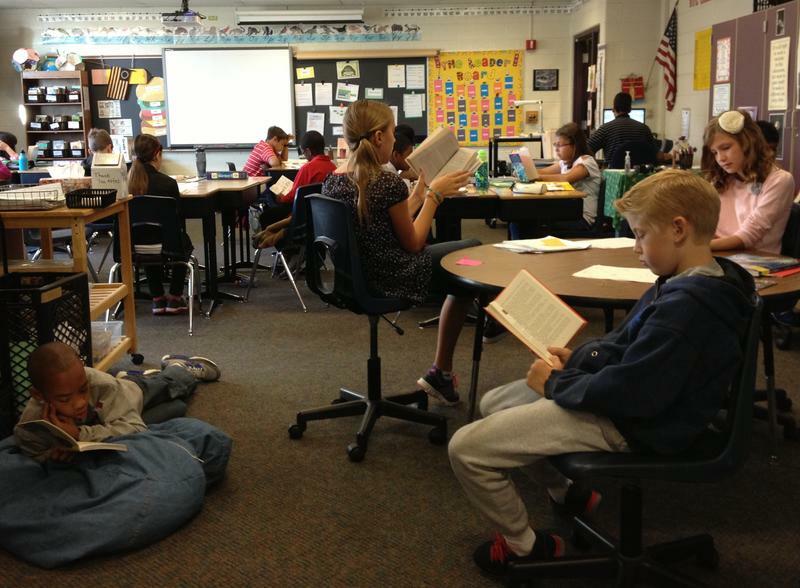 Each week, a handful of students get pulled out of class for half an hour and make their way over to the school library, where they're paired up with an 826 Michigan volunteer – roughly two to three students per volunteer. The students work on their stories for six weeks, and each student's story gets published in a chapbook at the end. Brandi Valerio teaches second grade at Adams, and she sees the writing workshop as "an amazing time for [students] to build self-confidence" and close relationships with an adult other than their teacher. As for having several students miss out on class in the middle of the day? Valerio doesn't mind. She says having her students' stories published in a bound book is worth more than the roughly three hours of class time they miss out on. During the workshop, some students work on their "About the Author" page, others work on their own stories. The day I visited, Shabrion Edwards was just starting her story – "Attack of the Smallies, Part Two" – about zombie hamsters taking over the world, while Mackenzie Booker was putting the finishing touches on her story about a tooth fairy who goes to collect teeth every night, only to find that all the teeth have been stolen by the Sand Man. A story about zombie hamsters that attack humans! Chris Johnson is the principal at Adams STEM Academy, where roughly two-thirds of the students qualify for free and reduced lunch. The district can't afford a full-time media specialist, so Maggie Gibbons has become the de facto librarian. She's there four days a week, shelving and helping students pick out fun, age appropriate books. That's on top of what Gibbons and her team of volunteers do in the library with the creative writing workshop. Johnson says "it's amazing what they provide for our kids who ordinarily wouldn't get that opportunity." "With all of the curriculum requirements and pacing guides ... a lot of the creativity gets pushed aside," says Johnson. The writing workshop "provides a dedicated time where creativity runs the show." Tiara Brooks, 8, just finished her story about a star named Twinkle and a sneaky fox, and she can't wait to have it published in the chapbook. It will make me "feel like I'm an artist because I'm in a book, and I never been in a real book before." Want to hear more about the Adventures of the Tricky Fox? Click on the play button below to hear Tiara read her story.